Liberia's former president, Charles Taylor, has spoken out for the first time since he began his exile in the eastern Nigerian town of Calabar eight months ago. Mr Taylor - who is wanted on war crimes charges in Sierra Leone - was sent to Nigeria as part of a peace deal set up by the Nigerian government to help end Liberia's bloody civil war. The one hour interview was broadcast on the independent television stations, Channells Television. Mr Taylor, gave his first interview in exile, sitting on a throne-like chair in his home in the eastern Nigerian town of Calabar. Mr Taylor, who relocated to Nigeria last August, said he felt "absolutely safe" - despite a reported $2m bounty on his head, and an Interpol warrant for his arrest. He was equally confident when asked about the UN-backed Sierra Leone War Crimes tribunal - which accuses him of backing a brutal rebellion in that country. 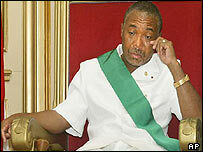 "Some terrible things happened in Sierra Leone, but I was not responsible," said Mr Taylor. The only point his urbane manner broke - was when he was asked if he missed home. After describing his farm, and the men he played cards with, he lapsed into silence, apparently too moved to speak. This is the first time Mr Taylor has been allowed to talk to the press since arriving in Nigeria. Presidential spokeswoman Remy Oyo told the BBC the timing was unconnected to Tuesdays state visit by the current Liberian leader, Gyude Bryant. It's clear, however, that this is not the last time Mr Taylor intends to be heard. The former president said he was writing a book, and added that he wanted to return to Liberia and set up a foundation for orphans, war wounded and gifted children.